OSWEGO – During the holiday season, the employees of Oswego Health donated more than $4,000 to the Blessings in a Backpack Program. Standing from left, Valerie Favata, Frank Lackey, Dawn Smith (who helped coordinate the effort), Melissa Russell of Blessings in a Backpack, Lynelle Lindsay (who also helped coordinate the Oswego Health’s donation), Cheryl Stilwell and Margaret Duplessis. In the back row are Jeff Coakley, James Marco, Christine Close, Barry Ryle, Kevin Tyson, Julie Struallo, Kathryn Pagliaroli and Kelley Montagna. Blessings in a Backpack provides elementary schoolchildren on the federal free and reduced price meal program with a backpack with food to take home for 38 weekends during the school year. The food includes easy-to-prepare, ready-to-eat items, such as granola bars, juice boxes, macaroni and cheese and oatmeal. The backpacks are given discreetly to the participating children in the Oswego and Fulton School districts, as well as New Haven Elementary in Mexico. There are approximately 300 enrolled children. 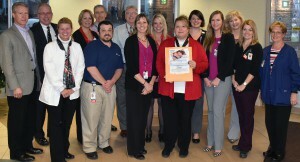 Oswego Health’s donation will assist 54 students.